Latest news, reviews, and info about DSi games and accessories. Hey y'all. I'll be on blog break. Will try to be back on Monday for more DSi news and stuff. Hope you all have a wonderful Holiday. Best wishes! 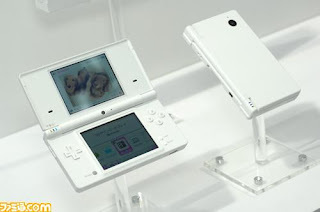 We've finally have an image of what is soon to be one of the first limited edition Nintendo DSi. Square Enix did a splendid paint-job on this particular special ed. 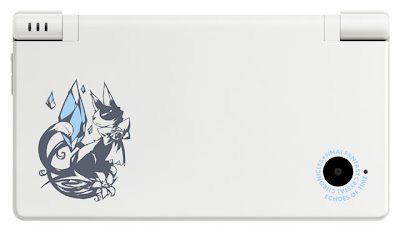 As reported on a previous post, Final Fantasy Crystal Chronicles: Echoes of Time's cat-with-a-bowtie mascot is on the front of the DSi. Unlike previous special editions from Square Enix, there's a nice touch of color to this one. I'm also liking the blue text wrapping around the DSi's external camera. FFCC: Echoes of Time is set for a Jan 29 release. If you own a DSi, then better pre-order your copy at Play-Asia. The site is called Ugoku Memo Hatena. I call it The Most Awesome Moving Memo Pad Animation Gallery because that's what it is. Moving Memo Pad will be available for free on the Japanese DSiWare Store. It's basically an organizer of sorts that comes with a cool feature that lets you create your own animations. You can then share your work on Ugoku Memo Hatena, or download other people's animations. Here's a couple of my favorite Moving Memo Pad animations. Please accept my apologies if it plays automatically. The Japanase DSi Shop will open December 24th, a week from now. Nintendo goodies like demos and software will be available for download in exchange with points. To get the buzz going, Nintendo decided to release a couple of trailers of upcoming downloads. WARNING!!! If you're not Japanese, then better head somewhere else, as the following videos will sure make you curse Nintendo for not bringing the DSi to North America sooner. Looks like some of the classic Brain Age/Training games made the cut. Also, there's some type of image-matching game. Your picture is also used for your profile, instead of just your signature. The Dsi camera is expected to be used quite a lot in this game. It's a software to take down notes and memo, and let's you animate them to your heart's content. You can also record your voice with a memo complete with appropriate sound effects. Calendar included. I don't know what the hell this dude is trying to tell me, but what he's doing is a step above awesome. With a straw, his wiggly mouth, and a copy of Korg DS-10, he turned a Nintendo DSi into a working talkbox. For those not in the know, a talkbox is what you use to make those robot sounds on techno songs. Also, please note the guy's eyewear. Above awesome indeed. It's bound to happen, and Acekard has the claim of being the first to produce a DSi flash cart. As the video below will show, the Acekard 2i works with a Japanese DSi. Castlevania: Order of Ecclesia plays smoothly, and before that the menu looks good as well. It is also worth noting that Acekard 2i works with both DSi and DS Lite. But will this DSi flash cart work on new DSi games when they come out? The Acekard 2i is now available on Acekard's website for homebrewers to enjoy. Remember kids, say no to pirating! DSi, First Month Tally: 500,000 Sold!! I guess the early surveys were wrong after all. After the first month of DSi mania in Japan, the numbers are in: 500,000 units sold! That's 50,000 units shy of the DS Lite's record. Although Enterbrain's numbers says the actual DSi sales is 535,379. One thing's for sure, the DSi is on its way to another Nintendo success. This brings up the total DS sales to a staggering 24,239,590 units. We did it! We finally got our very own DSi Store! Visit our DSi Store page to buy all your DSi games, accessories, and console needs. Looking for 3DS Games? Try our 3DS Store instead! DSi Games is a blog dedicated to Nintendo DSi. We feature games, news, info and accessories for DSi. Please drop us a comment and come back often!